He saw visions of God. The Word of the Lord came upon him. This expression means he knew God was speaking directly to him. The hand of the Lord was upon him. This expression means that the Lord God was moving the prophet to do something. The visions came solely to him. The Hebrew word hai means “expressly”, and is this word is used in Jeremiah and Ezekiel to describe the reception of God’s Word given uniquely to that prophet. Other men for whom God opened the Heavens to were Daniel, Isaiah, Elisha, Stephen, Paul and John. The phrase “the hand of the Lord was upon him” or “came upon me” is found exactly seven times in the Book of Ezekiel (1:3; 3:14, 22; 8:1; 33:22; 37:1 and 40:1). This describes Ezekiel’s direction for his ministry. He was not acting on his own. These visions were from God, who chose him to minister in a very detailed manner, to the Nation Israel at a critical time in their history when they would have been quite sensitive and receptive to God’s Word. Prophetic divine revelation to a legitimate biblical prophet is an overpowering experience. Many commentators have difficulty with the following passages. The imagery “opened up” to Ezekiel is impossible to describe using human terms. As a result he uses similes and metaphors (“as” and “like”) to describe the indescribable. He sees visions within the Throne Room of God that he cannot describe, but he must do so anyway. He is attempting to put the magnificence of the infinite into our finite minds. This is the task of the prophet, to convey the infinite to the finite. Next the prophet describes a metal-like substance that projects out of the middle of the fire that has the property of glowing like a red-hot iron that has been prepared in a blacksmith’s forge for a special task. The Hebrew text designates the color of the fire and the metal-like object as chashmal. The Hebrew word chashmal, is from two roots, which mean “smooth” and “brass” (Ezekiel 1:7; Revelation 1:15). The Septuagint and Vulgate Bible translate it, “electrum” which is described as a brilliant metal composed of gold and silver. In Chapter 10 these four living creatures are identified as “cherubim” in verses 5 and 20. The Hebrew word for living creature is chayot and it is used in a number of places in the Old Testament. They guard the Garden of Eden with flaming swords, which closed off access to the Garden (Genesis 3:24). 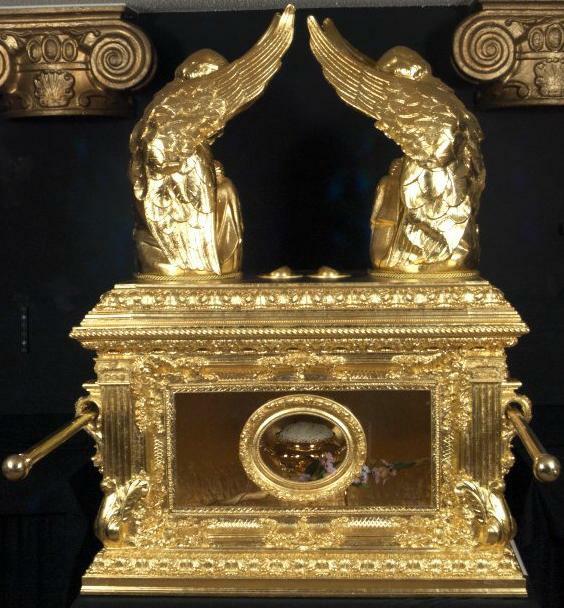 Cherubim were placed on the top of the mercy seat of the Ark of the Covenant. Their likeness was embroidered on the curtain of the Tabernacle to guard the Holy of Holies (Exodus 25: 10-22; 26:31). The apostle John saw the same four living beings in the Throne Room of God and around God (Revelation 4-5). The wings of the cherubim just touch each other across the Mercy Seat in the Holy of Holies (I Kings 6:27). The human shape supersedes the other characteristics as the predominate form. Each Cherub has four faces and four wings, which correspond to the human characteristics of each one. This is not a likeness of God (which is expressly forbidden), and these are beings He created, but are not Him (Exodus 20:4). They are obedient to His will, are His instruments used for His highest purposes, and they carry out His commands. Placement wise, they are the closest celestial beings to God in His Throne Room. In these verses they appear to be underneath the throne because Ezekiel is looking at the vision from the vantage point of being on the earth. 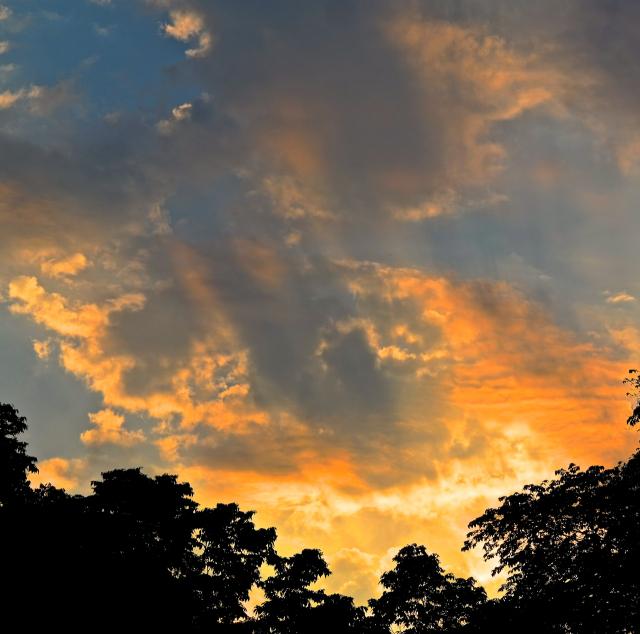 In Revelation 4-5 John’s vision is from the vantage point of being in Heaven and in the Throne Room of God, and he sees the cherubim covering (or encircling) the Throne. We see a similar scene in Ezekiel chapter 28 where he describes the fall of the anointed cherub Halal (Latin: Lucifer), who became Satan the adversary. Before his fall, Hallel was covering the throne of God, and was above it as the arch cherub. So, while the appearance of the Cherubim has the dominant characteristic of a human, they also have feet like an ox, which are straight, or upright. There is no foot set at a 90˚ angles from the leg. The sole of their feet in this vision is said to be like glowing brass, as if they were burning in a furnace. This has the implication of trampling the earth in righteous judgment. They all had human hands under their wings. In contrast to the legs and feet, the hands provided them with dexterity, which the lower extremities did not have. The hand is the symbol of “leading power, guided by skillfulness” (Psalm 78:72). These creatures were not four footed, that is like an animal with four feet, they were like a human. Their hands are under wings, which show that they are fitted for service in the celestial sphere. The wings are joined together so there is perfect unity of action among the four living creatures. That is, they moved together in perfect harmony of motion as the Lord directs. He guides and governs their actions. In the Throne Room scene in the Revelation 4:7 and chapter 5 the four living creatures are separated, but here they are united for a different purpose. “They had the face of a man; and they four had the face of a lion on the right side; and they four had the face of an ox on the left side; they four had also the face of an eagle.” Here as mentioned, the dominant feature is of a man, followed by a lion, then an ox and finally an eagle. In the Revelation 4:7 the order of their likeness is the lion first, followed by man, then the calf (ox), and finally a flying eagle. The activity that is being carried out at God’s command is what seems to dictate what face is described first, and in what order. In Revelation 5 the Lion of the Tribe of Judah, our Lord Jesus, is taking control of the earth when He takes the seven-sealed scroll, the title deed to the earth, from the hand of God the Father (Revelation 5:5-10). In Ezekiel 1:10 the focus is on man, and his face is the first described, indicating God’s tenderness of judgment. On the right Ezekiel sees the lion, on the left the ox, and the face of the eagle is behind. The human face represents the thought that man, who is made “after the image of God”, is the highest symbol of the Eternal Order (Genesis 1:27). The lion is the emblem of sovereignty, both in the Temple and in Solomon’s palace (1 Kings 7:29; 10:20; 2 Chronicles 9:18, 19). The ox here is aligned with the lion, as demonstrated in the twelve oxen that supported the “sea” or “laver” in the Temple, and clearly indicates doing work or providing a service (1 Kings 7:25, 44). Here also we have an example of sovereignty, where the natural symbol of strength (ox) is made subservient to human uses. The eagle is the emblem of kingly power, and is used elsewhere (Ezekiel 17:3, 7). The human face represents the Son of Man who shared in the glory of the Father. Jesus Christ is also linked to the ox with that of His sacrifice; with the lion with that of His sovereignty over Israel, as the Lion of the tribe of Judah (Revelation 5:5); and with the eagle with Him bearing His people on eagles’ wings into the highest heavens (Exodus 19:4; Deuteronomy 32:11). Matthew the The Lion expresses royalty, and calls Christ the Lion of the Tribe of Judah, and is Christ’s prominent feature in the Book of Matthew. Mark the The Ox, expresses laboring in endurance, and is Christ’s prominent feature in the Book of Mark. Luke the The Man, expresses brotherly sympathy with the whole race of man, and is Christ’s prominent feature in the Book of Luke. John the The Eagle, expresses soaring majesty and also as the Divine Word, and is Christ’s prominent feature in the Book of John. What is interesting regarding these symbols is that they do not express the personal character of the Evangelists, but express the different characteristics of the Lord Jesus our Christ in relation to the world. Ezekiel next sees “the living creatures” (Cherubim) as having mobility with a set of wheels (in Hebrew the word is opan). 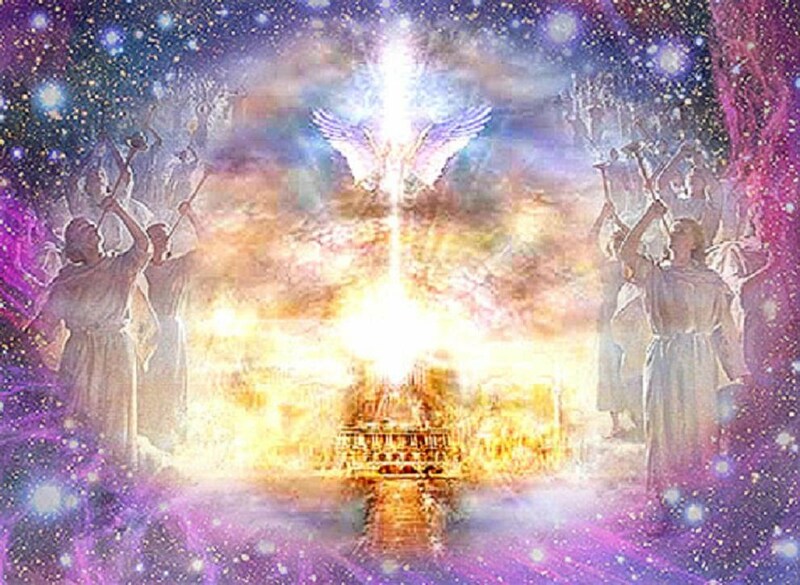 Even though this vision was of a Heavenly scene, the wheels of the Cherubim extend to the earth indicating God’s sovereignty over the earth. He saw four wheels, one for each of the four faces on each Cherubim. The wheels are said to be “beside” the Cherubim. The wheels Ezekiel saw were the lowest part of the chariot-throne, and sat on the ground below the Cherubim. We get the image of the Cherubim being attached to the wheels, as if they themselves are the wagon or platform of the wheels. This completes the vehicle on which God will be transported, or supported, from one location to another. Ezekiel begins to describe the wheels of the chariot and starts by describing them as the color of “beryl”, which was probably a green, or turquoise. The Hebrew word for “beryl” is tarsheesh, and suggests the name of the region where the stone is mined, which is Tarshish. This is a divine color and is found on the fourth row of the breastplate of the high priest (Exodus 28:20). Each of the four wheels had another wheel within itself, placed at a right angle. It had the appearance of a gyroscope. A gyroscope is a device with a spinning wheel, consisting of another wheel within it, that spins rapidly like a child’s top. The spinning motion keeps the stability evenly fixed regardless of the direction in which it moves. The gyroscope is an accurate navigational instrument and an effective stabilizing device in ships and airplanes. 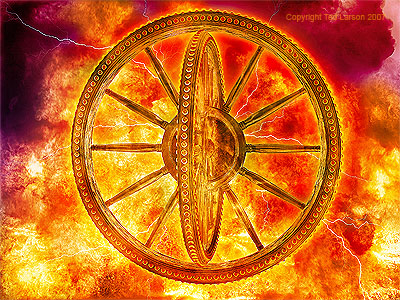 Having a wheel inside a wheel allows the chariot to immediately change direction. It is as if the wheel inside a wheel produces a freedom of movement unique to Heaven, apart from the constraints of the physics of time and space in the universe. They can be said to “hover” as opposed to simply move. This high level of mobility symbolizes the omnipresence of God. This is a crude comparison, but it is helpful to try and describe God’s great motion as the Cherubim in the chariot move Him as He commands. The wheels sparkled with the color. The sparkling wheels appeared to Ezekiel like the appearance of precious stones, which could roll in four directions without turning themselves. Ezekiel describes the wheels as rims, and says they were “high and dreadful” (in Hebrew the word is yerah). His description is one of witnessing wheels that were large, an astounding, or awesome sight, but not one that is frightening. His vision is further compounded by the appearance of “eyes” all around the rims of the wheels. These are symbolic of God’s divine omniscience in the creation at all levels, and all times (II Chronicles 16:9; Proverbs 16:3; Zechariah 3:9, 4:10; Revelation 4:6). They represent God’s complete, perfect divine intellect. Simply put, God knows everything, including our thoughts. These usages of rakeeah are not quaint poetic hyperbole or exaggerations. They are meant to express the properties of the heavens that we cannot see, or fully understand. Space is not an empty vacuum. 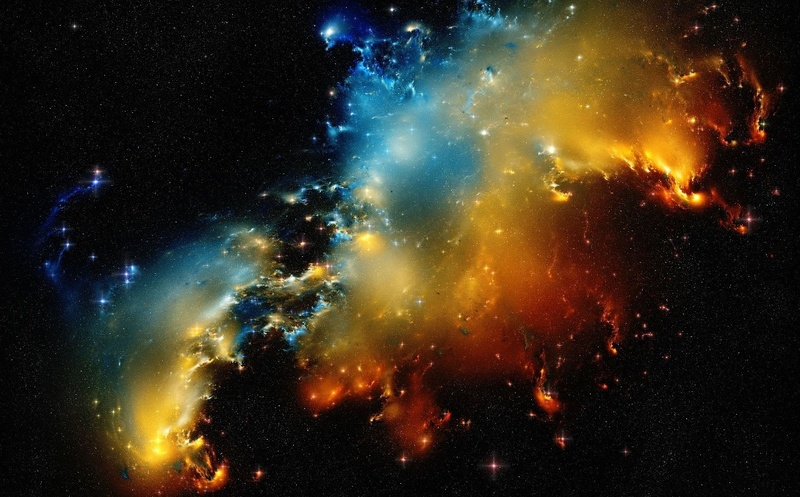 We have difficulty defining space and understanding this concept of the property of space. Scripture gives us some insight as to some of its properties. It can be shaken. (Hebrews 12:26; Haggai 2:6; Isaiah 13:13). The shining brilliance of the expanse above the Cherubim that Ezekiel saw reminded him of crystals sparkling in the light of the sun. When the Apostle John was spiritized on the Isle of Patmos, he saw the Throne Room of God, and he said the expanse around God’s throne is clear as “crystal” (Revelation 4:6). As the Cherubim moved their wings they created a sound that Ezekiel likened to a great waterfall, with its deafening sound so loud that it overpowered any other sounds. As the creature moved, Ezekiel also hears a second sound, “like the voice of the Almighty,” which resembles thunder, or the movement of ancient armed forces (“a host”). 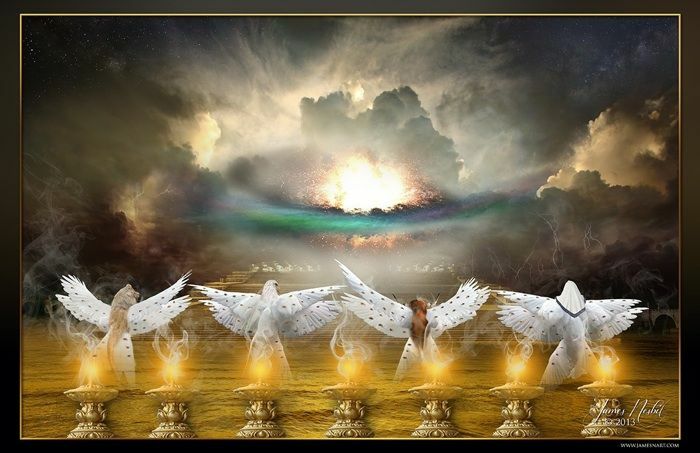 These sounds only occurred as the Cherubim were in motion. Clearly their wings enabled them to propel themselves as the motion stopped when their wings stopped moving. The similarity of these visions lets us know that God has a general human-like appearance. The vision reaffirms the nature of God as holy, powerful, and majestic. The rainbow is a reminder that God makes and keeps His promises, and that God can and will help humanity. (Genesis 9:13, 16). It is an assurance that nothing, including geographic location, can ever separate a believer from God (Romans 8:38–39). Brown, David. (1887, 1997). A Commentary, Critical and Explanatory, on the Old and New Testaments Oak Harbor, WA: Logos Research Systems, Inc.
Encyclopedia Judaica. (1999). CD ROM Vol. 6. Wenger, Paul D. (1999). The Journey from Texts to Translation, the Origin and Development of the Bible. Grand Rapids, MI: Bridge Point Books Division of Baker Books. Rosenberg, Rabbi A.J. (1991). The Book of Ezekiel. NY: The Judaica Press, Inc.